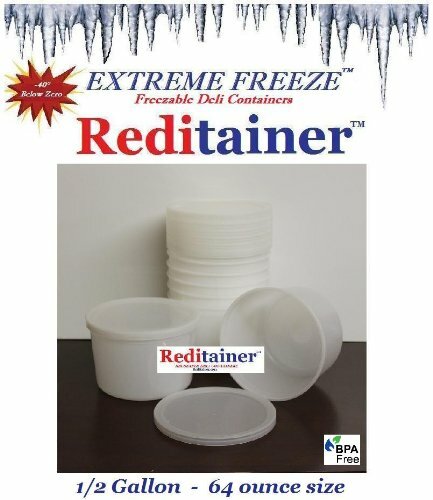 Extreme Freeze Reditainer 64 ounce Freezeable Deli Containers. Package of 8 with tight fitting lids. Designed especially for Freezing, capable of withstanding temperature to ( - 40 degrees ) for extended periods of time. Stackable engineered polypropylene plastic. Microwaveable & Dishwasher safe. Microwaveable - Reuseable - Dishwasher Safe. Designed especially for Freezing, capable of withstanding temperature to (-40 degrees ) for extended periods of time. View More In Food Savers & Storage Containers. If you have any questions about this product by Extreme Freeze, contact us by completing and submitting the form below. If you are looking for a specif part number, please include it with your message.